Today I am delighted to be welcoming Emma Barnes, author of Wild Thing, to Library Mice for a guest post. 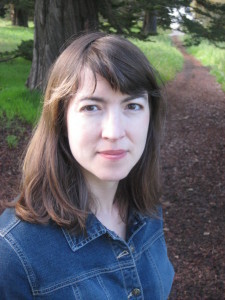 Emma has won much acclaim for her book Wolfie, and has written several other children’s books, including Jessica Haggerthwaite: Witch Dispatcher. 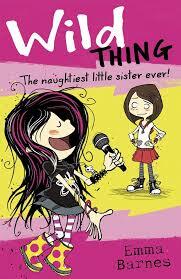 Wild thing is her latest fiction book, aimed at 8 to 12 year-olds and has been described as a modern day My Naughty Little Sister! You can read more about Emma on her website. Emma has also written and very insightful and interesting article about age-banding that I recommend reading, regardless and whether you are pro or con age banding. You can find the article here. I’ve always denied that I write from life. When my aunt claimed my mum as the reality behind a character in my first book, Jessica Haggerthwaite: Witch Dispatcher, I pointed out that said character was a highly superstitious, New Age witch, given to gadding about in purple cloaks and making nettle soup, while my mum is a totally rationalist, science-trained, cardigan-wearing maths teacher. Point made, I felt. I have to confess that Wild Thing is a bit different. It’s the tale of two sisters, narrated by the elder. I am one of two sisters. I know only too well the daily horrors of Big Sister life. Like the infuriating experience of being late every day because Little Sister has a sweetly understanding teacher, making her oblivious to time – while I have a strict, demanding one. 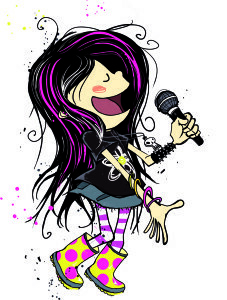 “Your sister is no excuse for YOU to be late,” my teacher thundered. What am I supposed to do, I retorted, when Little Sister has forgotten her pants? Actually I didn’t say that – too embarrassing. But it was true. And as we had already walked half a mile to school when the discovery was made (those were the days – children walked!) it was quite a long way to walk home to fetch them (after she had proved to me she really had forgotten them by surreptitiously raising her skirt in a shop doorway). Later Little Sister introduced a menagerie of animals to the house. I remember crawling around the garden hunting for her missing guineau pig, which I had foolishly let escape from its run, knowing I would reap the whirlwind should I fail to find it. Maybe it was these experiences that led to me opening a book with an older sister designing a poster headed “Sister For Sale”. Maybe writing Wild Thing was my revenge! Becoming a parent just rekindles some of those feelings. Like Kate, I have had my bottom bitten in a supermarket. All right, I didn’t then pursue the biter through the aisles and end up under an avalanche of malty pops. But I was tempted. Most of all these days I identify with Wild Thing’s Dad. Yes, despite the fact that Dad is a prematurely widowed, semi-retired rock guitarist (and I am a married children’s writer who can’t play a single guitar chord) I know exactly where Dad is coming from. As when the girls’ grandmother asks if he has bought the girls’ school things. “But tomorrow is Tuesday!” said Gran. Now, I have never forgotten when term starts. I have, on the other hand, forgotten when it ends…and booked a holiday accordingly. That was embarrassing, especially as I only discovered my mistake the day before and had a lot of groveling to do, for having broken the Terrible Taboo of Term Time Holidays. Dad and I are both in the “creative industries” and half finished stories like half finished songs can result in forgotten PE kits, dinner money, cakes for the bun sale, PTA meetings, school pick ups. Or most likely that’s just our feeble excuse. The truth is, although the family of Wild Thing might seem particularly chaotic, it’s chaos probably reflects most families. And that IS writing from real life. My daughter (a younger sister) LOVED Wild Thing – it really made her chuckle out loud and any reference to bottom biting is enough to set her off again. Husband (also an ex-member of a band who now does a lot of child wrangling) liked how there was so much humour around Wild Thing’s anarchy but it was also very affectionate – you really care about the characters. We can’t wait for the next book in this house.